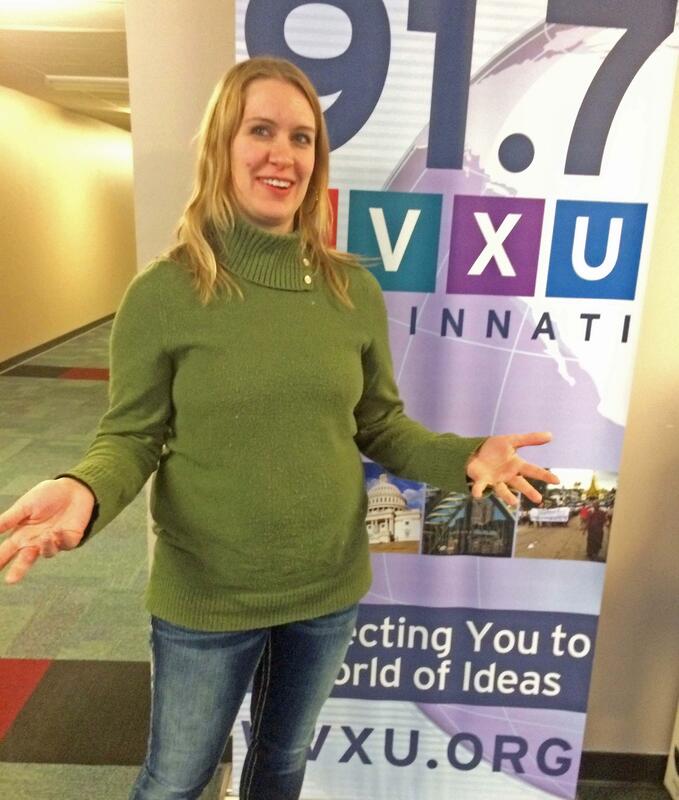 Amy Burgess visits WVXU-FM without her Rosie Red costume. I'm fascinated by Rosie Red's ability to convey excitement, empathy, and other emotions without saying a word or making any facial expressions. She's a very talented mime. I hope she doesn't get a big head. When the Reds added the Rosie character 11 years ago, the club hired Burgess, a five-year veteran of the "Rally Pack" cheerleaders/entertainers at Great American Ball Park. The Anderson Township resident also had filled in as Gapper. Yes, I said Gapper. Before Rosie's GABP debut, Burgess was invited to film some Reds promotions with Gapper, Mr. Red and Mr. Redlegs. "Then they gave me the (Rosie) suit when I left the taping," she said. "They told me to practice. So I practiced the kind of stuff that I thought the Rosie character would do." Mascots Rosie Red and Gapper communicate with a wave, dance or a tilt of the head. 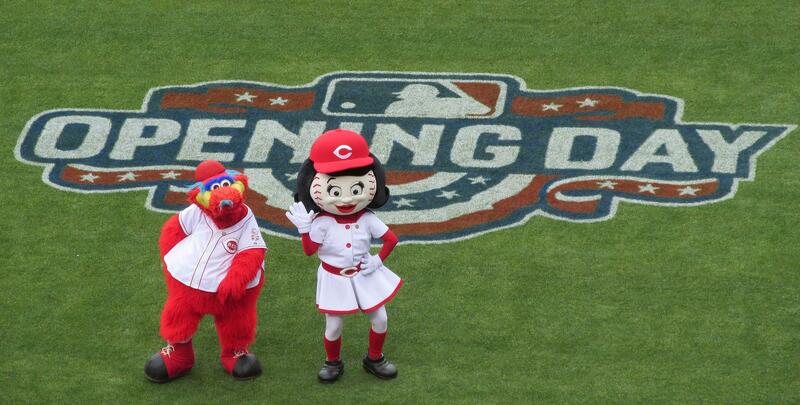 The characteristics she improvised for Rosie, rehearsing in her living room, remain the core of the Reds' only female mascot. "I decided she was a little bit sassy, a little bit spunky. I wanted her to be able to hold her own with the boys, kind of A League Of Their Own quality," Burgess said, referring to the 1992 Geena Davis-led flick about women who play professional baseball as men get deployed during World War II. 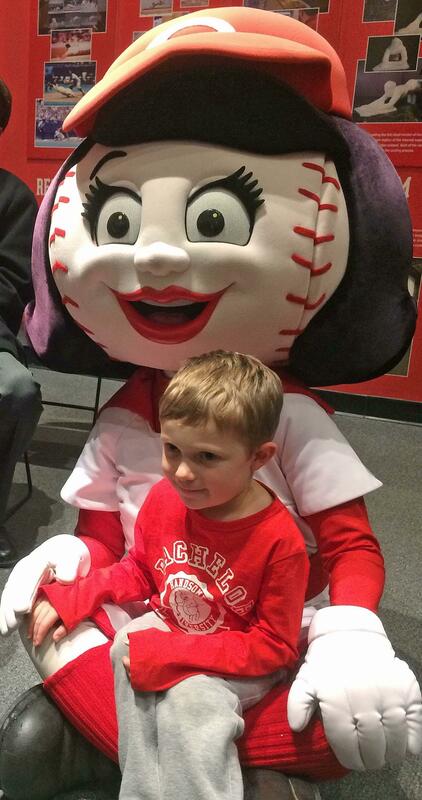 A young fan sits in Rosie's lap during a program at the Reds Hall of Fame and Museum in January. "But I also wanted her to have a nourishing side to her, where she could take care of kids, and kind of be mom-ish to the other mascots." Burgess, an Anderson High School graduate, is married with two young daughters. She took dance lessons as a girl, and earned a bachelor's degree in theater from Miami University. When she's not romping around as Rosie, she choreographs school and community theater productions. Amy and her husband, Jason Burgess, a Highlands High School drama teacher, also run the non-profit CAST (Commonwealth Artists Student Theatre) that will produce two shows this summer with area high school students. BEST FEELING: "There's nothing really sweeter than seeing like, a 100-yard dash from a little girl who has waited all week to see you, and just barrels into you for a big hug. I mean, it doesn't get any better than that. " 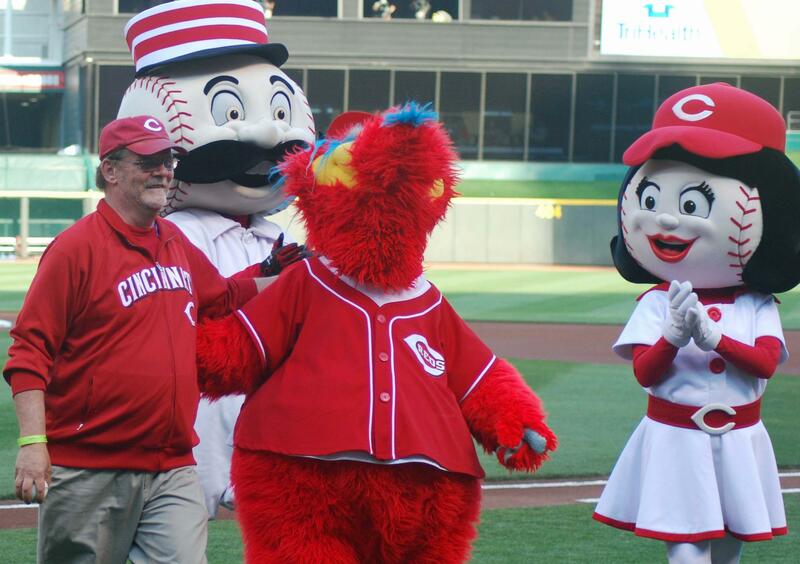 Rosie, Gapper and Mr. Redlegs congratulate Howard Wilkinson after his ceremonial first pitch in 2012. CAREER CHOICE: "At the time I graduated (from Miami), this was never on my radar: 'I'm gonna grow up and be a mascot!'" BEST PART OF OPENING DAY: "Oh my gosh! Opening Day! You just say the words and everyone is like, 'Yes!' We show up at the ball park at 5:30 a.m. for a 4:10 p.m. game (to appear on morning TV news)… It's a really long day, and I don't know that I'd have it any other way. It's fantastic." Tune in to "Around Cincinnati" at 7 p.m. Sunday, March 18, to get the inside scoop on Rosie Red from the woman who knows her best. 10 a.m. Thursday March 15 update: Jeff Brogan, WCPO-TV general manager, tells me: "I can confirm that Chris Riva’s last day with WCPO was last Friday. We decided to go in another direction with the position for Good Morning Tri-State and his contract was not renewed. We’re working to position the show to offer the best coverage for our audiences and will determine whether we will have two anchors or one. Kathrine Nero will solo anchor the show for now.